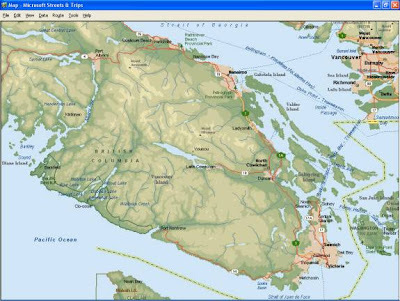 I made a business trip to Vancouver Island in British Columbia back in June, 2004. The island is mountainous and heavily forested. I had a treacherous drive through the mountains on questionable roadways full of big trucks and giant old-growth trees right up to the edge of the road. My return trip started at Port Alberni airport in the interior of the island. My destination was the ferry at Nanaimo to go back to Vancouver. Since there were no rest stops along the mountain road, I was plenty hungry and found this “Hot Dog Truck” at the ferry waiting area. Pretty slick. My customer and his “toy” at Port Alberni.